Well! The weekend started with a bang! I trimmed the workweek by one day and started my weekend early. The idea hatched in my brain and quickly spread to the mind of my riding partner, Jaz. Let’s do a weekend of riding and photography in Kenai, Alaska! Why Kenai you ask? Well, it so happens that a co-worker spent a lot of time working on the restoration of a beautiful Russian Orthodox Church. This church is one of Alaska’s 49 National Historic Landmarks and is located in Kenai. There is currently a photo contest going on to be in the NHL calendar printed by the National Park Service. I thought, “Hey, my hobby is photography. Why not send an entry in?” Most of the NHLs in Alaska are not on the road system, and the ones that are tend to be well represented by photos. I wasn’t that interested in the little ole church in Kenai, until I learned of the recent restoration work. The possibility to photograph it in a new perspective – I was sold. Sold on the idea of photographing the Holy Assumption Russian Orthodox Church. The next challenge; call the father and ask permission. He said no problem, come on down. He has made arrangements for us to photograph the church on Friday afternoon, but warned that it is dark and I might need to consider additional lighting. Hmm… how do I bungee cord additional light-boxes and stands to the motorcycle? Next problem: I am not allowed near the alter because I don’t have a “Y” chromosome. Hmm… I don’ think I can buy or order one of those. I agreed not to desecrate the alter. Do I seem like the type that would desecrate? I joked with a co-worker that I was going to put my finger on the alter when the father wasn’t looking. But of course I would honor the traditions and be respectful of the privilege provided (I will be watching Jaz like a hawk though). My current fiasco of ending my coffee drinking habits resulted in a headache all day. This, coupled with the ungodly (no pun intended) task of carrying the lights and extension cords, resulted in a last minute decision to do the ride in Jaz’s Mini Cooper instead of by motorbike. By 8PM we rolled into Copper Landing, Alaska. 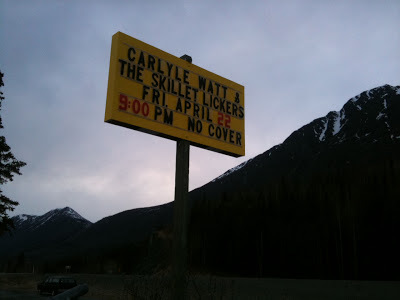 The marque on the sign announced that last weekend’s musical entertainment of this town with a population of 369, was Carlyle Watt and the Skillet Lickers. Damn! It looks like I missed a hot show last weekend. No cover. Wow. Fun self-assignment. 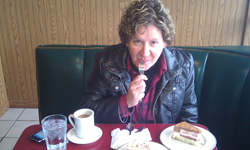 I had friends in Kansas City who went to a small Russian Orthodox Church, so I went several times. I remember the whole no-woman thing about the altar. I was never that into the theological part of the (very long) services — like most of the little gang of us kids (teens) who went along with the mom who was the actual church member, we were coming to hear the musical liturgy, which is usually FABULOUS. The icons are usually also just stunning, and a very interesting approach to focusing one's spiritual thoughts. We'll expect to see some photos here and on Ice Gal's blog, yes? Can't imagine you without coffee!